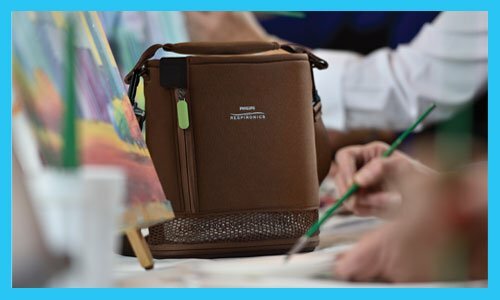 With launching three different types of oxygen concentrators, Philips has been able to give back the freedom and flexibility all oxygen users deserve by providing them with a suitable solution. Beneath we will discuss the three different Philips oxygen concentrators. EverFlo is the stationary concentrator that requires the least maintenance of all concentrators available today. With no filter for the user to maintain, fewer moving parts than comparable concentrators, and a durable metal oxygen outlet, EverFlo is designed to deliver consistent and trouble-free operation. EverFlo is compact, has a streamlined and integrated handle and weighs only 14 kilograms. EverFlo features 4 small wheels, which makes moving it a lot easier. Besides, EverFlo can be used with extra oxygen tubing to create more length of tubing between the concentrator and the nasal cannula. Philips EverFlo provides a continuous flow of oxygen of up to 5 litres of oxygen per minute at its highest setting. At this setting, EverFlo uses a total of 350 watts, making the EverFlo amazingly energy efficient. 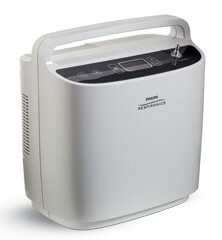 Philips Respironics EverFlo is ideal for use with a humidifier through a special connection at the backside of the concentrator. Due to the continuous flow of oxygen the EverFlo produces, the nose of the user can become irritated. With a humidifier the oxygen is first passed through a water-filled humidifier, before being led to the user. It is important to replace the humidifier regularly, so that no lime will arise. 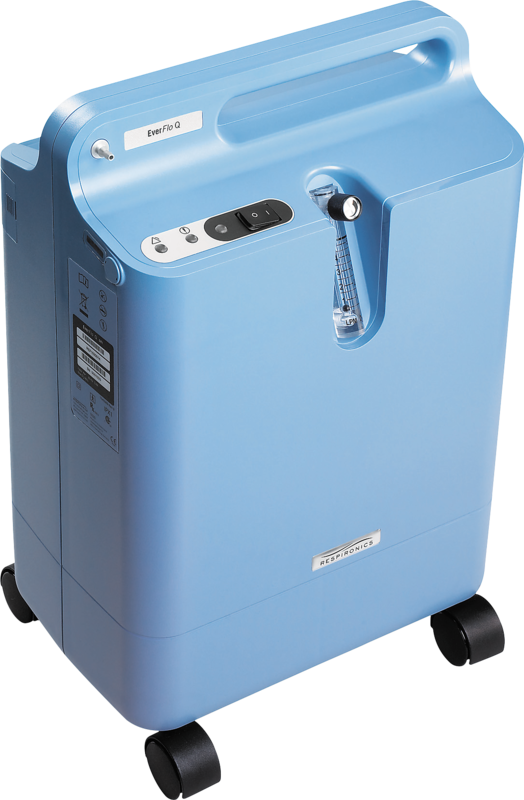 SimplyGo is Philips’ first portable oxygen concentrator with both a continuous and a pulse mode. By having created a single device with both modes, Philips meets the needs of nearly all the oxygen users. SimplyGo weighs only 4.5 kilograms and is extremely user-friendly because of its easy-to-use touchscreen. SimplyGo has a internal battery which has a duration of 2 hours at pulse setting 2. At continuous mode setting 2, the duration of the battery is just below 1 hour. The battery duration can be doubled by using an extra battery and external battery module. Furthermore, the SimplyGo is FAA approved, which means that it is permitted to use the concentrator on board aircraft. During development, SimplyGo was rigorously tested and subjected to extreme conditions including impacts, vibrations, and temperatures to deliver reliable performance day in and day out. Philips Respironics SimplyGo comes with a battery, carry bag, cart, DC power supply, AC power supply and an accessory bag. 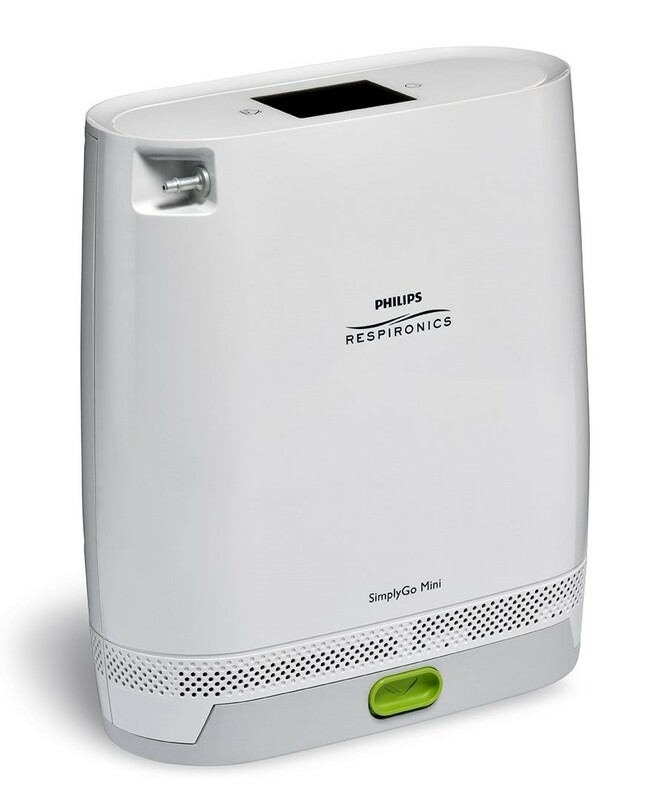 Philips Respironics SimplyGo Mini is the portable Philips oxygen concentrator. SimplyGo Mini is available with a small (8 cell) battery or a large (16 cell) battery. With a weight of 2.3 kg (including small battery) and 2.7 kg (including a large battery), the SimplyGo Mini is designed to help the user to remain active. From a walk in the park to an overnight trip, SimplyGo Mini provides you with flexibility while on the go. The battery duration of the SimplyGo Mini concentrator differs per setting. At setting 2 the small battery has a duration of 4.5 hours and the large battery a duration of up to 9 hours. These battery duration times are based on 20 beats per minute. Furthermore, an easy-to-use LCD touchscreen provides a user-friendly experience. The design is both compact and robust and this concentrator has also been extensively tested against impacts, vibrations and different temperatures. If you purchase a SimplyGo Mini concentrator, you are assured of a very reliable oxygen concentrator! Philips Respironics SimplyGo Mini comes with a battery, carry bag, AC power supply, DC power supply and an accessory bag. In addition, the following accessories are available: a backpack, extra batteries and an external battery charger. More information about the Philips EverFlo, SimplyGo and SimplyGo Mini oxygen concentrators can be found in our online shop. Do you still have questions after having read this article or are some things not yet completely clear? Do not hesitate to contact u. You can contact us through the chat at the bottom left of your screen. You can also call us during office hours on +31 85 0190 291 (International) or on +44 20 3290 0209 (UK). Contacting us by email is also possible, just send your message to info@oxigo.co and we will contact you as soon as possible. We are happy to help you! Take good care of your concentrator!